This chapter describes how to create and work with MTLRenderCommandEncoder and MTLParallelRenderCommandEncoder objects, which are used to encode graphics rendering commands into a command buffer. MTLRenderCommandEncoder commands describe a graphics rendering pipeline, as seen in Figure 5-1. A MTLRenderCommandEncoder object represents a single rendering command encoder. A MTLParallelRenderCommandEncoder object enables a single rendering pass to be broken into a number of separate MTLRenderCommandEncoder objects, each of which may be assigned to a different thread. The commands from the different render command encoders are then chained together and executed in a consistent, predictable order, as described in Multiple Threads for a Rendering Pass. Create a MTLRenderPassDescriptor object to define a collection of attachments that serve as the rendering destination for the graphics commands in the command buffer for that rendering pass. Typically, you create a MTLRenderPassDescriptor object once and reuse it each time your app renders a frame. See Creating a Render Pass Descriptor. Create a MTLRenderCommandEncoder object by calling the renderCommandEncoderWithDescriptor: method of MTLCommandBuffer with the specified render pass descriptor. See Using the Render Pass Descriptor to Create a Render Command Encoder. Create a MTLRenderPipelineState object to define the state of the graphics rendering pipeline (including shaders, blending, multisampling, and visibility testing) for one or more draw calls. To use this render pipeline state for drawing primitives, call the setRenderPipelineState: method of MTLRenderCommandEncoder. For details, see Creating a Render Pipeline State. Set textures, buffers, and samplers to be used by the render command encoder, as described in Specifying Resources for a Render Command Encoder. Call MTLRenderCommandEncoder methods to specify additional fixed-function state, including the depth and stencil state, as explained in Fixed-Function State Operations. Finally, call MTLRenderCommandEncoder methods to draw graphics primitives, as described in Drawing Geometric Primitives. A MTLRenderPassDescriptor object represents the destination for the encoded rendering commands, which is a collection of attachments. The properties of a render pass descriptor may include an array of up to four attachments for color pixel data, one attachment for depth pixel data, and one attachment for stencil pixel data. The renderPassDescriptor convenience method creates a MTLRenderPassDescriptor object with color, depth, and stencil attachment properties with default attachment state. The visibilityResultBuffer property specifies a buffer where the device can update to indicate whether any samples pass the depth and stencil tests—for details, see Fixed-Function State Operations. Each individual attachment, including the texture that will be written to, is represented by an attachment descriptor. For an attachment descriptor, the pixel format of the associated texture must be chosen appropriately to store color, depth, or stencil data. For a color attachment descriptor, MTLRenderPassColorAttachmentDescriptor, use a color-renderable pixel format. For a depth attachment descriptor, MTLRenderPassDepthAttachmentDescriptor, use a depth-renderable pixel format, such as MTLPixelFormatDepth32Float. For a stencil attachment descriptor, MTLRenderPassStencilAttachmentDescriptor, use a stencil-renderable pixel format, such as MTLPixelFormatStencil8. The amount of memory the texture actually uses per pixel on the device does not always match the size of the texture’s pixel format in the Metal framework code, because the device adds padding for alignment or other purposes. See the Metal Feature Set Tables chapter for how much memory is actually used for each pixel format, as well limitations on the size and number of attachments. MTLLoadActionClear, which writes the same value to every pixel in the specified attachment descriptor. For more detail about this action, see Specifying the Clear Load Action. MTLLoadActionLoad, which preserves the existing contents of the texture. MTLLoadActionDontCare, which allows each pixel in the attachment to take on any value at the start of the rendering pass. If your application will render all pixels of the attachment for a given frame, use the default load action MTLLoadActionDontCare. The MTLLoadActionDontCare action allows the GPU to avoid loading the existing contents of the texture, ensuring the best performance. Otherwise, you can use the MTLLoadActionClear action to clear the previous contents of the attachment, or the MTLLoadActionLoad action to preserve them. The MTLLoadActionClear action also avoids loading the existing texture contents, but it incurs the cost of filling the destination with a solid color. MTLStoreActionStore, which saves the final results of the rendering pass into the attachment. MTLStoreActionMultisampleResolve, which resolves the multisample data from the render target into single sample values, stores them in the texture specified by the attachment property resolveTexture, and leaves the contents of the attachment undefined. For details, see Example: Creating a Render Pass Descriptor for Multisampled Rendering. MTLStoreActionDontCare, which leaves the attachment in an undefined state after the rendering pass is complete. This may improve performance as it enables the implementation to avoid any work necessary to preserve the rendering results. For color attachments, the MTLStoreActionStore action is the default store action, because applications almost always preserve the final color values in the attachment at the end of rendering pass. For depth and stencil attachments, MTLStoreActionDontCare is the default store action, because those attachments typically do not need to be preserved after the rendering pass is complete. If the loadAction property of an attachment descriptor is set to MTLLoadActionClear, then a clearing value is written to every pixel in the specified attachment descriptor at the start of a rendering pass. The clearing value property depends upon the type of attachment. For MTLRenderPassColorAttachmentDescriptor, clearColor contains a MTLClearColor value that consists of four double-precision floating-point RGBA components and is used to clear the color attachment. The MTLClearColorMake function creates a clear color value from red, green, blue, and alpha components. The default clear color is (0.0, 0.0, 0.0, 1.0), or opaque black. For MTLRenderPassDepthAttachmentDescriptor, clearDepth contains one double-precision floating-point clearing value in the range [0.0, 1.0] that is used to clear the depth attachment. The default value is 1.0. For MTLRenderPassStencilAttachmentDescriptor, clearStencil contains one 32-bit unsigned integer that is used to clear the stencil attachment. The default value is 0. Listing 5-1 creates a simple render pass descriptor with color and depth attachments. First, two texture objects are created, one with a color-renderable pixel format and the other with a depth pixel format. Next the renderPassDescriptor convenience method of MTLRenderPassDescriptor creates a default render pass descriptor. Then the color and depth attachments are accessed through the properties of MTLRenderPassDescriptor. The textures and actions are set in colorAttachments, which represents the first color attachment (at index 0 in the array), and the depth attachment. To use the MTLStoreActionMultisampleResolve action, you must set the texture property to a multisample-type texture, and the resolveTexture property will contain the result of the multisample resolve operation. (If texture does not support multisampling, then the result of a multisample resolve action is undefined.) The resolveLevel, resolveSlice, and resolveDepthPlane properties may also be used for the multisample resolve operation to specify the mipmap level, cube slice, and depth plane of the multisample texture, respectively. In most cases, the default values for resolveLevel, resolveSlice, and resolveDepthPlane are usable. In Listing 5-2, an attachment is initially created and then its loadAction, storeAction, texture, and resolveTexture properties are set to support multisample resolve. After you create a render pass descriptor and specify its properties, use the renderCommandEncoderWithDescriptor: method of a MTLCommandBuffer object to create a render command encoder, as shown in Listing 5-3. Core Animation defines the CAMetalLayer class, which is designed for the specialized behavior of a layer-backed view whose content is rendered using Metal. A CAMetalLayer object represents information about the geometry of the content (position and size), its visual attributes (background color, border, and shadow), and the resources used by Metal to present the content in a color attachment. It also encapsulates the timing of content presentation so that the content can be displayed as soon as it is available or at a specified time. For more information about Core Animation, see the Core Animation Programming Guide. Core Animation also defines the CAMetalDrawable protocol for objects that are displayable resources. The CAMetalDrawable protocol extends MTLDrawable and provides an object that conforms to the MTLTexture protocol, so it can be used as a destination for rendering commands. To render into a CAMetalLayer object, you should get a new CAMetalDrawable object for each rendering pass, get the MTLTexture object that it provides, and use that texture to create the color attachment. Unlike color attachments, creation and destruction of a depth or stencil attachment are costly. If you need either depth or stencil attachments, create them once and then reuse them each time a frame is rendered. Typically, you use the layerClass method to designate CAMetalLayer as the backing layer type for your own custom UIView subclass, as shown in Listing 5-4. Otherwise, you can create a CAMetalLayer with its init method and include the layer in an existing view. The device property declares the MTLDevice object that the resource is created from. The pixelFormat property declares the pixel format of the texture. The supported values are MTLPixelFormatBGRA8Unorm (the default) and MTLPixelFormatBGRA8Unorm_sRGB. The drawableSize property declares the dimensions of the texture in device pixels. To ensure that your app renders content at the precise dimensions of the display (without requiring an additional sampling stage on some devices), take the target screen’s nativeScale or nativeBounds property into account when calculating the desired size for your layer. The framebufferOnly property declares whether the texture can be used only as an attachment (YES) or whether it can also be used for texture sampling and pixel read/write operations (NO). If YES, the layer object can optimize the texture for display. For most apps, the recommended value is YES. The presentsWithTransaction property declares whether changes to the layer's rendered resource are updated with standard Core Animation transaction mechanisms (YES) or are updated asynchronously to normal layer updates (NO, the default value). The texture property holds the texture object. You use this as an attachment when creating your rendering pipeline (MTLRenderPipelineColorAttachmentDescriptor object). The layer property points to the CAMetalLayer object that responsible for displaying the drawable. Important: There are only a small set of drawable resources, so a long frame rendering time could temporarily exhaust those resources and cause a nextDrawable method call to block its CPU thread until the method is completed. To avoid expensive CPU stalls, perform all per-frame operations that do not need a drawable resource before calling the nextDrawable method of a CAMetalLayer object. To display the contents of a drawable object after rendering is complete, you must submit it to Core Animation by calling the drawable object’s present method. To synchronize presentation of a drawable with completion of the command buffer responsible for its rendering, you can call either the presentDrawable: or presentDrawable:atTime: convenience method on a MTLCommandBuffer object. These methods use the scheduled handler (see Registering Handler Blocks for Command Buffer Execution) to call the drawable’s present method, which covers most scenarios. The presentDrawable:atTime: method provides further control over when the drawable is presented. To use a MTLRenderCommandEncoder object to encode rendering commands, you must first specify a MTLRenderPipelineState object to define the graphics state for any draw calls. A render pipeline state object is a long-lived persistent object that can be created outside of a render command encoder, cached in advance, and reused across several render command encoders. When describing the same set of graphics state, reusing a previously created render pipeline state object may avoid expensive operations that re-evaluate and translate the specified state to GPU commands. A render pipeline state is an immutable object. To create a render pipeline state, you first create and configure a mutable MTLRenderPipelineDescriptor object that describes the attributes of a render pipeline state. Then, you use the descriptor to create a MTLRenderPipelineState object. 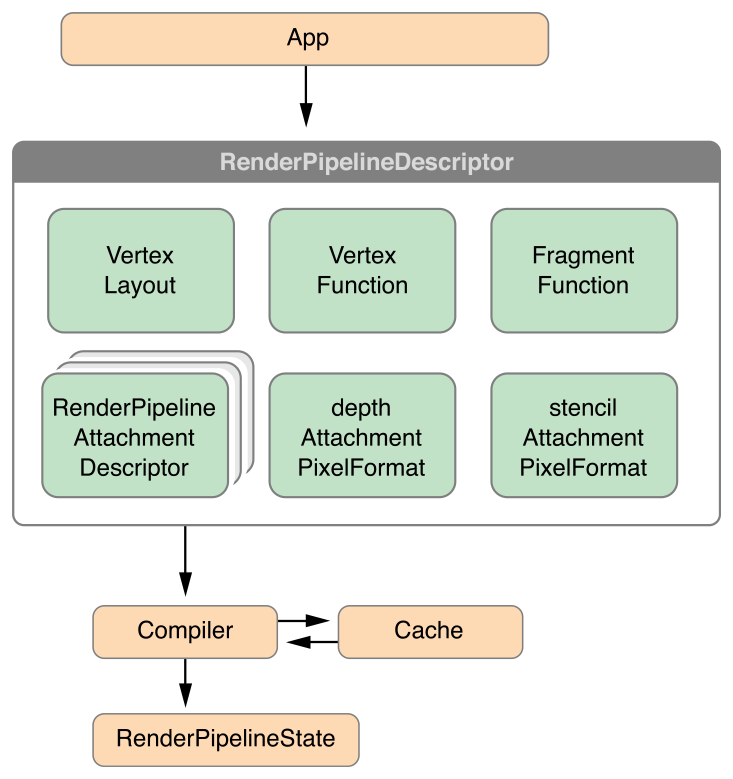 To create a render pipeline state, first create a MTLRenderPipelineDescriptor object, which has properties that describe the graphics rendering pipeline state you want to use during the rendering pass, as depicted in Figure 5-2. The colorAttachments property of the new MTLRenderPipelineDescriptor object contains an array of MTLRenderPipelineColorAttachmentDescriptor objects, and each descriptor represents a color attachment state that specifies the blend operations and factors for that attachment, as detailed in Configuring Blending in a Render Pipeline Attachment Descriptor. The attachment descriptor also specifies the pixel format of the attachment, which must match the pixel format for the texture of the render pipeline descriptor with the corresponding attachment index, or an error occurs. Set the depthAttachmentPixelFormat property to match the pixel format for the texture of depthAttachment in MTLRenderPassDescriptor. Set the stencilAttachmentPixelFormat property to match the pixel format for the texture of stencilAttachment in MTLRenderPassDescriptor. To specify the vertex or fragment shader in the render pipeline state, set the vertexFunction or fragmentFunction property, respectively. Setting fragmentFunction to nil disables the rasterization of pixels into the specified color attachment, which is typically used for depth-only rendering or for outputting data into a buffer object from the vertex shader. If the vertex shader has an argument with per-vertex input attributes, set the vertexDescriptor property to describe the organization of the vertex data in that argument, as described in Vertex Descriptor for Data Organization. The default value of YES for the rasterizationEnabled property is sufficient for most typical rendering tasks. To use only the vertex stage of the graphics pipeline (for example, to gather data transformed in a vertex shader), set this property to NO. If the attachment supports multisampling (that is, the attachment is a MTLTextureType2DMultisample type texture), then multiple samples can be created per pixel. To determine how fragments combine to provide pixel coverage, use the following MTLRenderPipelineDescriptor properties. The sampleCount property determines the number of samples for each pixel. When MTLRenderCommandEncoder is created, the sampleCount for the textures for all attachments must match this sampleCount property. If the attachment cannot support multisampling, then sampleCount is 1, which is also the default value. If alphaToCoverageEnabled is set to YES, then the alpha channel fragment output for colorAttachments is read and used to determine a coverage mask. After creating a render pipeline descriptor and specifying its properties, use it to create the MTLRenderPipelineState object. Because creating a render pipeline state can require an expensive evaluation of graphics state and a possible compilation of the specified graphics shaders, you can use either a blocking or an asynchronous method to schedule such work in a way that best fits the design of your app. To synchronously create the render pipeline state object, call either the newRenderPipelineStateWithDescriptor:error: or newRenderPipelineStateWithDescriptor:options:reflection:error: method of a MTLDevice object. These methods block the current thread while Metal evaluates the descriptor’s graphics state information and compiles shader code to create the pipeline state object. To asynchronously create the render pipeline state object, call either the newRenderPipelineStateWithDescriptor:completionHandler: or newRenderPipelineStateWithDescriptor:options:completionHandler: method of a MTLDevice object. These methods return immediately—Metal asynchronously evaluates the descriptor’s graphics state information and compiles shader code to create the pipeline state object, then calls your completion handler to provide the new MTLRenderPipelineState object. When you create a MTLRenderPipelineState object you can also choose to create reflection data that reveals details of the pipeline’s shader function and its arguments. The newRenderPipelineStateWithDescriptor:options:reflection:error: and newRenderPipelineStateWithDescriptor:options:completionHandler: methods provide this data. Avoid obtaining reflection data if it will not be used. For more information on how to analyze reflection data, see Determining Function Details at Runtime. After you create a MTLRenderPipelineState object, call the setRenderPipelineState: method of MTLRenderCommandEncoder to associate the render pipeline state with the command encoder for use in rendering. Listing 5-5 demonstrates the creation of a render pipeline state object called pipeline. The variables vertFunc and fragFunc are shader functions that are specified as properties of the render pipeline state descriptor called renderPipelineDesc. Calling the newRenderPipelineStateWithDescriptor:error: method of the MTLDevice object synchronously uses the pipeline state descriptor to create the render pipeline state object. Calling the setRenderPipelineState: method of MTLRenderCommandEncoder specifies the MTLRenderPipelineState object to use with the render command encoder. Note: Because a MTLRenderPipelineState object is expensive to create, you should reuse it whenever you want to use the same graphics state. Blending uses a highly configurable blend operation to mix the output returned by the fragment function (source) with pixel values in the attachment (destination). Blend operations determine how the source and destination values are combined with blend factors. To enable blending, set blendingEnabled to YES. Blending is disabled, by default. writeMask identifies which color channels are blended. The default value MTLColorWriteMaskAll allows all color channels to be blended. rgbBlendOperation and alphaBlendOperation separately assign the blend operations for the RGB and Alpha fragment data with a MTLBlendOperation value. The default value for both properties is MTLBlendOperationAdd. sourceRGBBlendFactor, sourceAlphaBlendFactor, destinationRGBBlendFactor, and destinationAlphaBlendFactor assign the source and destination blend factors. Four blend factors refer to a constant blend color value: MTLBlendFactorBlendColor, MTLBlendFactorOneMinusBlendColor, MTLBlendFactorBlendAlpha, and MTLBlendFactorOneMinusBlendAlpha. Call the setBlendColorRed:green:blue:alpha: method of MTLRenderCommandEncoder to specify the constant color and alpha values used with these blend factors, as described in Fixed-Function State Operations. Listing 5-6 shows code for a custom blending configuration, using the blend operation MTLBlendOperationAdd, the source blend factor MTLBlendFactorOne, and the destination blend factor MTLBlendFactorOneMinusSourceAlpha. colorAttachments is a MTLRenderPipelineColorAttachmentDescriptor object with properties that specify the blending configuration. The MTLRenderCommandEncoder methods discussed in this section specify resources that are used as arguments for the vertex and fragment shader functions, which are specified by the vertexFunction and fragmentFunction properties in a MTLRenderPipelineState object. 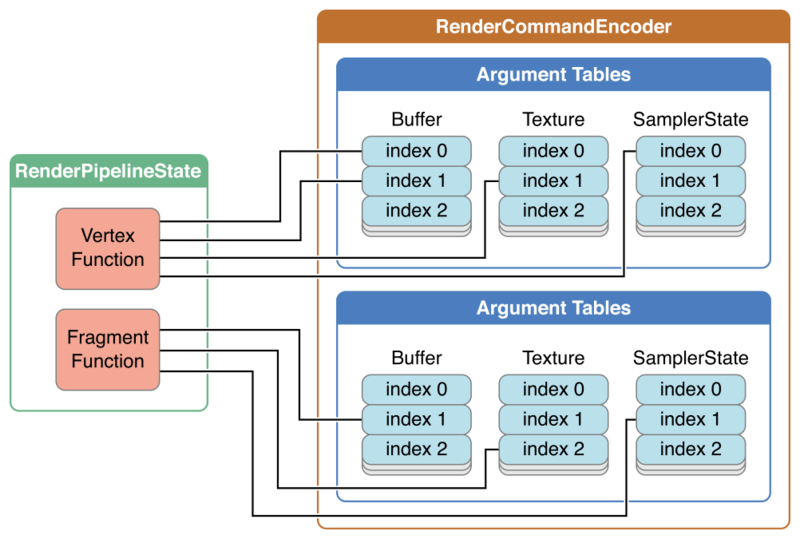 These methods assign a shader resource (buffers, textures, and samplers) to the corresponding argument table index (atIndex) in the render command encoder, as shown in Figure 5-3. The following setVertex* methods assign one or more resources to corresponding arguments of a vertex shader function. These setFragment* methods similarly assign one or more resources to corresponding arguments of a fragment shader function. There are a maximum of 31 entries in the buffer argument table, 31 entries in the texture argument table, and 16 entries in the sampler state argument table. The attribute qualifiers that specify resource locations in the Metal shading language source code must match the argument table indices in the Metal framework methods. In Listing 5-7, two buffers (posBuf and texCoordBuf) with indices 0 and 1, respectively, are defined for the vertex shader. In Listing 5-8, the function signature has corresponding arguments with the attribute qualifiers buffer(0) and buffer(1). Similarly, in Listing 5-9, a buffer, a texture, and a sampler (fragmentColorBuf, shadeTex, and sampler, respectively), all with index 0, are defined for the fragment shader. In Listing 5-10, the function signature has corresponding arguments with the attribute qualifiers buffer(0), texture(0), and sampler(0), respectively. In Metal framework code, there can be one MTLVertexDescriptor for every pipeline state that describes the organization of data input to the vertex shader function and shares resource location information between the shading language and framework code. In Metal shading language code, per-vertex inputs (such as scalars or vectors of integer or floating-point values) can be organized in one struct, which can be passed in one argument that is declared with the [[ stage_in ]] attribute qualifier, as seen in the VertexInput struct for the example vertex function vertexMath in Listing 5-11. Each field of the per-vertex input struct has the [[ attribute(index) ]] qualifier, which specifies the index in the vertex attribute argument table. To refer to the shader function input using the [[ stage_in ]] qualifier, describe a MTLVertexDescriptor object and then set it as the vertexDescriptor property of MTLRenderPipelineState. MTLVertexDescriptor has two properties: attributes and layouts. bufferIndex, which is an index to the buffer argument table that specifies which MTLBuffer is accessed. The buffer argument table is discussed in Specifying Resources for a Render Command Encoder. format, which specifies how the data should be interpreted in the framework code. If the data type is not an exact type match, it may be converted or expanded. For example, if the shading language type is half4 and the framework format is MTLVertexFormatFloat2, then when the data is used as an argument to the vertex function, it may be converted from float to half and expanded from two to four elements (with 0.0, 1.0 in the last two elements). offset, which specifies where the data can be found from the start of a vertex. Figure 5-4 illustrates a MTLVertexAttributeDescriptorArray in Metal framework code that implements an interleaved buffer that corresponds to the input to the vertex function vertexMath in the shading language code in Listing 5-11. Listing 5-12 shows the Metal framework code that corresponds to the interleaved buffer shown in Figure 5-4. Each MTLVertexAttributeDescriptor object in the attributes array of the MTLVertexDescriptor object corresponds to the indexed struct member in VertexInput in the shader function. attributes.bufferIndex = 0 specifies the use of the buffer at index 0 in the argument table. (In this example, each MTLVertexAttributeDescriptor has the same bufferIndex, so each refers to the same vertex buffer at index 0 in the argument table.) The offset values specify the location of data within the vertex, so attributes.offset = 2 * sizeof(float) locates the start of the corresponding data 8 bytes from the start of the buffer. The format values are chosen to match the data type in the shader function, so attributes.format = MTLVertexFormatFloat4 specifies the use of four floating-point values. The layouts property of MTLVertexDescriptor is a MTLVertexBufferLayoutDescriptorArray. For each MTLVertexBufferLayoutDescriptor in layouts, the properties specify how vertex and attribute data are fetched from the corresponding MTLBuffer in the argument table when Metal draws primitives. (For more on drawing primitives, see Drawing Geometric Primitives.) The stepFunction property of MTLVertexBufferLayoutDescriptor determines whether to fetch attribute data for every vertex, for some number of instances, or just once. If stepFunction is set to fetch attribute data for some number of instances, then the stepRate property of MTLVertexBufferLayoutDescriptor determines how many instances. The stride property specifies the distance between the data of two vertices, in bytes. 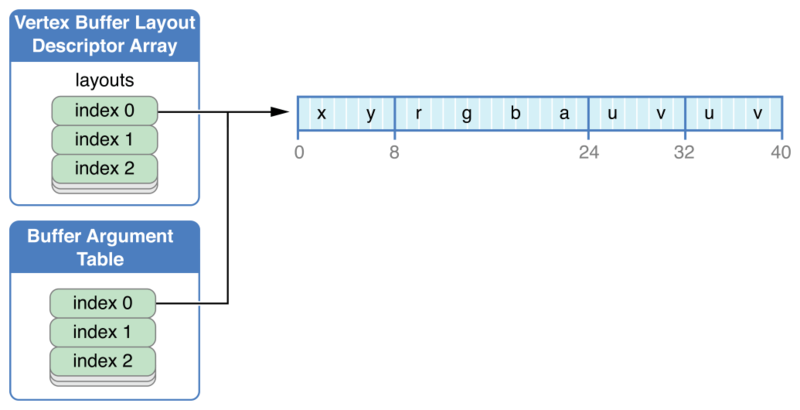 Figure 5-5 depicts the MTLVertexBufferLayoutDescriptor that corresponds to the code in Listing 5-12. layouts specifies how vertex data is fetched from corresponding index 0 in the buffer argument table. layouts.stride specifies a distance of 40 bytes between the data of two vertices. The value of layouts.stepFunction, MTLVertexStepFunctionPerVertex, specifies that attribute data is fetched for every vertex when drawing. If the value of stepFunction is MTLVertexStepFunctionPerInstance, the stepRate property determines how often attribute data is fetched. For example, if stepRate is 1, data is fetched for every instance; if stepRate is 2, for every two instances, and so on. setViewport: specifies the region, in screen coordinates, which is the destination for the projection of the virtual 3D world. The viewport is 3D, so it includes depth values; for details, see Working with Viewport and Pixel Coordinate Systems. setTriangleFillMode: determines whether to rasterize triangle and triangle strip primitives with lines (MTLTriangleFillModeLines) or as filled triangles (MTLTriangleFillModeFill). The default value is MTLTriangleFillModeFill. The value of setFrontFacingWinding: indicates whether a front-facing primitive has its vertices drawn in clockwise (MTLWindingClockwise) or counterclockwise (MTLWindingCounterClockwise) order. The default value is MTLWindingClockwise. The value of setCullMode: determines whether to perform culling (MTLCullModeNone, if culling disabled) or which type of primitive to cull (MTLCullModeFront or MTLCullModeBack). setScissorRect: specifies a 2D scissor rectangle. Fragments that lie outside the specified scissor rectangle are discarded. setDepthStencilState: sets the depth and stencil test state as described in Depth and Stencil States. setStencilReferenceValue: specifies the stencil reference value. setDepthBias:slopeScale:clamp: specifies an adjustment for comparing shadow maps to the depth values output from fragment shaders. setVisibilityResultMode:offset: determines whether to monitor if any samples pass the depth and stencil tests. If set to MTLVisibilityResultModeBoolean, then if any samples pass the depth and stencil tests, a non-zero value is written to a buffer specified by the visibilityResultBuffer property of MTLRenderPassDescriptor, as described in Creating a Render Pass Descriptor. You can use this mode to perform occlusion testing. If you draw a bounding box and no samples pass, then you may conclude that any objects within that bounding box are occluded and thus do not require rendering. setBlendColorRed:green:blue:alpha: specifies the constant blend color and alpha values, as detailed in Configuring Blending in a Render Pipeline Attachment Descriptor. Metal defines its Normalized Device Coordinate (NDC) system as a 2x2x1 cube with its center at (0, 0, 0.5). The left and bottom for x and y, respectively, of the NDC system are specified as -1. The right and top for x and y, respectively, of the NDC system are specified as +1. The viewport specifies the transformation from NDC to the window coordinates. The Metal viewport is a 3D transformation specified by the setViewport: method of MTLRenderCommandEncoder. The origin of the window coordinates is in the upper-left corner. In Metal, pixel centers are offset by (0.5, 0.5). For example, the pixel at the origin has its center at (0.5, 0.5); the center of the adjacent pixel to its right is (1.5, 0.5). This is also true for textures. Specify a custom MTLDepthStencilDescriptor object that contains settings for the depth/stencil state. Creating a custom MTLDepthStencilDescriptor object may require creating one or two MTLStencilDescriptor objects that are applicable to front-facing primitives and back-facing primitives. Create a MTLDepthStencilState object by calling the newDepthStencilStateWithDescriptor: method of MTLDevice with a depth/stencil state descriptor. To set the depth/stencil state, call the setDepthStencilState: method of MTLRenderCommandEncoder with the MTLDepthStencilState. If the stencil test is in use, call setStencilReferenceValue: to specify the stencil reference value. If the depth test is enabled, the render pipeline state must include a depth attachment to support writing the depth value. To perform the stencil test, the render pipeline state must include a stencil attachment. To configure attachments, see Creating and Configuring a Render Pipeline Descriptor. If you will be changing the depth/stencil state regularly, then you may want to reuse the state descriptor object, modifying its property values as needed to create more state objects. Note: To sample from a depth-format texture within a shader function, implement the sampling operation within the shader without using MTLSamplerState. To enable writing the depth value to the depth attachment, set depthWriteEnabled to YES. depthCompareFunction specifies how the depth test is performed. If a fragment’s depth value fails the depth test, the fragment is discarded. For example, the commonly used MTLCompareFunctionLess function causes fragment values that are further away from the viewer than the (previously written) pixel depth value to fail the depth test; that is, the fragment is considered occluded by the earlier depth value. The frontFaceStencil and backFaceStencil properties each specify a separate MTLStencilDescriptor object for front- and back-facing primitives. To use the same stencil state for both front- and back-facing primitives, you can assign the same MTLStencilDescriptor to both frontFaceStencil and backFaceStencil properties. To explicitly disable the stencil test for one or both faces, set the corresponding property to nil, the default value. Explicit disabling of a stencil state is not necessary. Metal determines whether to enable a stencil test based on whether the stencil descriptor is configured for a valid stencil operation. Listing 5-13 shows an example of creation and use of a MTLDepthStencilDescriptor object for the creation of a MTLDepthStencilState object, which is then used with a render command encoder. In this example, the stencil state for the front-facing primitives is accessed from the frontFaceStencil property of the depth/stencil state descriptor. The stencil test is explicitly disabled for the back-facing primitives. readMask is a bitmask; the GPU computes the bitwise AND of this mask with both the stencil reference value and the stored stencil value. The stencil test is a comparison between the resulting masked reference value and the masked stored value. writeMask is a bitmask that restricts which stencil values are written to the stencil attachment by the stencil operations. stencilCompareFunction specifies how the stencil test is performed for fragments. In Listing 5-13, the stencil comparison function is MTLCompareFunctionEqual, so the stencil test passes if the masked reference value is equal to masked stencil value already stored at the location of a fragment. stencilFailureOperation, depthFailureOperation, and depthStencilPassOperation specify what to do to a stencil value stored in the stencil attachment for three different test outcomes: if the stencil test fails, if the stencil test passes and the depth test fails, or if both stencil and depth tests succeed, respectively. In the preceding example, the stencil value is unchanged (MTLStencilOperationKeep) if the stencil test fails, but it is incremented if the stencil test passes, unless the stencil value is already the maximum possible (MTLStencilOperationIncrementClamp). After you have established the pipeline state and fixed-function state, you can call the following MTLRenderCommandEncoder methods to draw the geometric primitives. These draw methods reference resources (such as buffers that contain vertex coordinates, texture coordinates, surface normals, and other data) to execute the pipeline with the shader functions and other state you have previously established with MTLRenderCommandEncoder. drawPrimitives:vertexStart:vertexCount:instanceCount: renders a number of instances (instanceCount) of primitives using vertex data in contiguous array elements, starting with the first vertex at the array element at the index vertexStart and ending at the array element at the index vertexStart + vertexCount - 1.
drawPrimitives:vertexStart:vertexCount: is the same as the previous method with an instanceCount of 1.
drawIndexedPrimitives:indexCount:indexType:indexBuffer:indexBufferOffset:instanceCount: renders a number of instances (instanceCount) of primitives using an index list specified in the MTLBuffer object indexBuffer. indexCount determines the number of indices. The index list starts at the index that is indexBufferOffset byte offset within the data in indexBuffer. indexBufferOffset must be a multiple of the size of an index, which is determined by indexType. drawIndexedPrimitives:indexCount:indexType:indexBuffer:indexBufferOffset: is similar to the previous method with an instanceCount of 1. For every primitive rendering method listed above, the first input value determines the primitive type with one of the MTLPrimitiveType values. The other input values determine which vertices are used to assemble the primitives. For all these methods, the instanceStart input value determines the first instance to draw, and instanceCount input value determines how many instances to draw. As previously discussed, setTriangleFillMode: determines whether the triangles are rendered as filled or wireframe, and the setCullMode: and setFrontFacingWinding: settings determine whether the GPU culls triangles during rendering. For more information, see Fixed-Function State Operations). When rendering a point primitive, the shader language code for the vertex function must provide the [[ point_size ]] attribute, or the point size is undefined. When rendering a triangle primitive with flat shading, the attributes of the first vertex (also known as the provoking vertex) are used for the whole triangle. The shader language code for the vertex function must provide the [[ flat ]] interpolation qualifier. For details on all Metal shading language attributes and qualifiers, see Metal Shading Language Guide. To terminate a rendering pass, call endEncoding on the render command encoder. After ending the previous command encoder, you can create a new command encoder of any type to encode additional commands into the command buffer. The following steps, illustrated in Listing 5-14, describe a basic procedure for rendering a triangle. Create a MTLCommandQueue and use it to create a MTLCommandBuffer. Create a MTLRenderPassDescriptor that specifies a collection of attachments that serve as the destination for encoded rendering commands in the command buffer. In this example, only the first color attachment is set up and used. (The variable currentTexture is assumed to contain a MTLTexture that is used for a color attachment.) Then the MTLRenderPassDescriptor is used to create a new MTLRenderCommandEncoder. Create two MTLBuffer objects, posBuf and colBuf, and call newBufferWithBytes:length:options: to copy vertex coordinate and vertex color data, posData and colData, respectively, into the buffer storage. Call the setVertexBuffer:offset:atIndex: method of MTLRenderCommandEncoder twice to specify the coordinates and colors. The atIndex input value of the setVertexBuffer:offset:atIndex: method corresponds to the attribute buffer(atIndex) in the source code of the vertex function. Create a MTLLibrary with source code from progSrc, which is assumed to be a string that contains Metal shader source code. Then call the newFunctionWithName: method of MTLLibrary to create the MTLFunction vertFunc that represents the function called hello_vertex and to create the MTLFunction fragFunc that represents the function called hello_fragment. Finally, set the vertexFunction and fragmentFunction properties of the MTLRenderPipelineDescriptor with these MTLFunction objects. Create a MTLRenderPipelineState from the MTLRenderPipelineDescriptor by calling newRenderPipelineStateWithDescriptor:error: or a similar method of MTLDevice. Then the setRenderPipelineState: method of MTLRenderCommandEncoder uses the created pipeline state for rendering. Call the drawPrimitives:vertexStart:vertexCount: method of MTLRenderCommandEncoder to append commands to perform the rendering of a filled triangle (type MTLPrimitiveTypeTriangle). Call the endEncoding method to end encoding for this rendering pass. And call the commit method of MTLCommandBuffer to execute the commands on the device. In Listing 5-14, a MTLFunction object represents the shader function called hello_vertex. The setVertexBuffer:offset:atIndex: method of MTLRenderCommandEncoder is used to specify the vertex resources (in this case, two buffer objects) that are passed as arguments into hello_vertex. The atIndex input value of the setVertexBuffer:offset:atIndex: method corresponds to the attribute buffer(atIndex) in the source code of the vertex function, as shown in Listing 5-15. In some cases, your app’s performance can be limited by the single-CPU workload of encoding commands for a single rendering pass. However, attempting to circumvent this bottleneck by separating the workload into multiple rendering passes encoded on multiple CPU threads can also adversely impact performance, because each rendering pass requires its own intermediate attachment store and load actions to preserve the render target contents. Instead, use a MTLParallelRenderCommandEncoder object, which manages multiple subordinate MTLRenderCommandEncoder objects that share the same command buffer and render pass descriptor. The parallel render command encoder ensures that the attachment load and store actions occur only at the start and end of the entire rendering pass, not at the start and end of each subordinate render command encoder’s set of commands. With this architecture, you can assign each MTLRenderCommandEncoder object to its own thread in parallel in a safe and highly performant manner. To create a parallel render command encoder, use the parallelRenderCommandEncoderWithDescriptor: method of a MTLCommandBuffer object. To create subordinate render command encoders, call the renderCommandEncoder method of the MTLParallelRenderCommandEncoder object once for each CPU thread from which you want to perform command encoding. All subordinate command encoders created from the same parallel render command encoder encode commands to the same command buffer. Commands are encoded to a command buffer in the order in which the render command encoders are created. To end encoding for a specific render command encoder, call the endEncoding method of MTLRenderCommandEncoder. After you have ended encoding on all render command encoders created by the parallel render command encoder, call the endEncoding method of MTLParallelRenderCommandEncoder to end the rendering pass. Listing 5-16 shows the MTLParallelRenderCommandEncoder creating three MTLRenderCommandEncoder objects: rCE1, rCE2, and rCE3. The order in which the command encoders call endEncoding is not relevant to the order in which commands are encoded and appended to the MTLCommandBuffer. 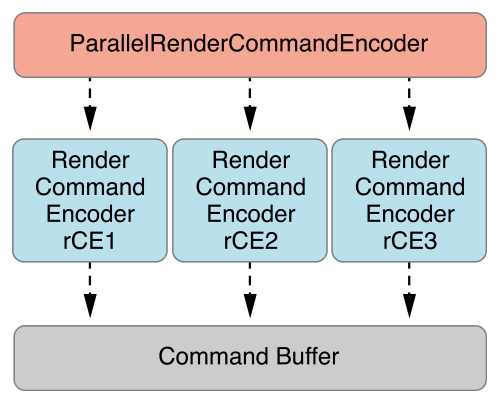 For MTLParallelRenderCommandEncoder, the MTLCommandBuffer always contains commands in the order that the subordinate render command encoders were created, as seen in Figure 5-6.